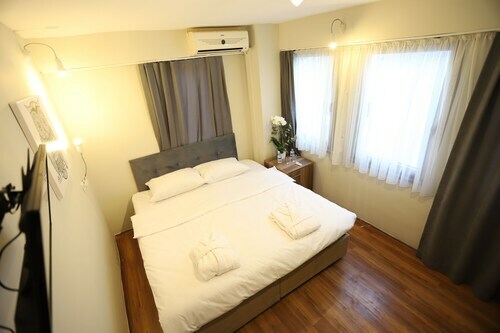 Located in Istanbul City Center, this bed & breakfast is within 1 mi (2 km) of Galata Tower, Taksim Square and Spice Bazaar. Suleymaniye Mosque and Grand Bazaar are also within 2 mi (3 km). Karakoy Station is only a 5-minute walk and Tophane Station is 6 minutes. Located in Bahcelievler, this bed & breakfast is within 3 miles (5 km) of Sinan Erdem Dome, CNR Expo Center and Marmara Forum. Atakoy Marina is 3 mi (4.8 km) away. Atakoy - Sirinevler Station is 9 minutes by foot and Yenibosna Station is 21 minutes. 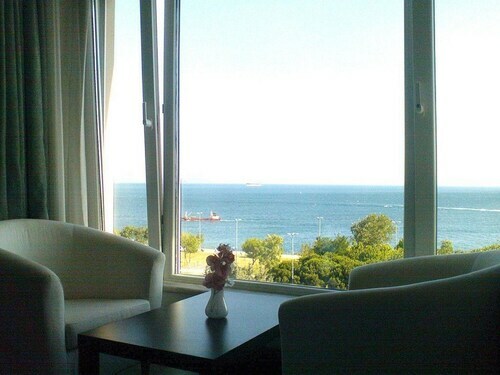 Located in Kadikoy, this bed & breakfast is within 1 mile (2 km) of Marmara University, Bagdat Avenue and Kadikoy Port. Emaar Square Mall and Akasya Acibadem Shopping Center are also within 3 miles (5 km). Istanbul Sogutlucesme Station is 6 minutes by foot and Istanbul Kiziltoprak Station is 12 minutes. Located in Istanbul City Center, this bed & breakfast is within a 10-minute walk of Basilica Cistern, Hagia Sophia and Eminonu Square. Sultanahmet Square and Topkapi Palace are also within 15 minutes. Gulhane Station is only a 2-minute walk and Sirkeci Station is 7 minutes. 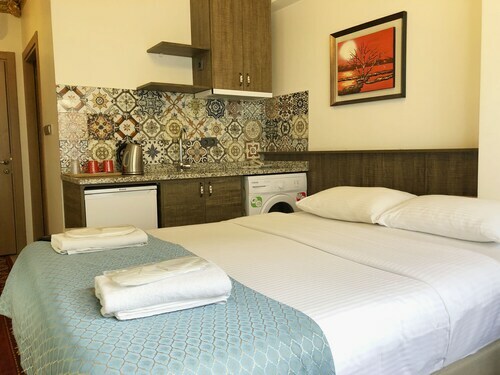 Located in Taksim, this bed & breakfast is within a 10-minute walk of Taksim Square and Istiklal Avenue. Dolmabahce Palace and Pera Museum are also within 1 mile (2 km). Taksim Station is only a 5-minute walk and Taşkışla Cable Car Station is 15 minutes. 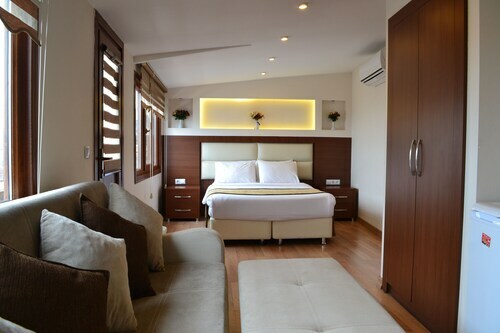 Located in Kadikoy, this bed & breakfast is within 1 mile (2 km) of Kadikoy Port and Bagdat Avenue. Marmara University and Maiden's Tower are also within 3 miles (5 km). Carsi Station is 6 minutes by foot and Iskele Camii Station is 9 minutes. 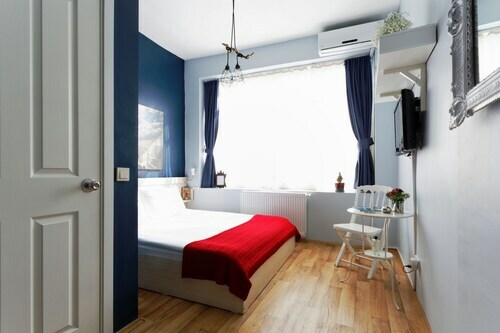 Located in Istanbul City Center, this bed & breakfast is within 1 mi (2 km) of Galata Tower and Taksim Square. Grand Bazaar and Hagia Sophia are also within 2 mi (3 km). Karakoy Station is only a 4-minute walk and Tophane Station is 6 minutes. Located in Sultanahmet, this bed & breakfast is within a 10-minute walk of Little Hagia Sophia and Hippodrome of Constantinople. Sultanahmet Square and Blue Mosque are also within 15 minutes. Sultanahmet Station is 11 minutes by foot and Cemberlitas Station is 13 minutes. 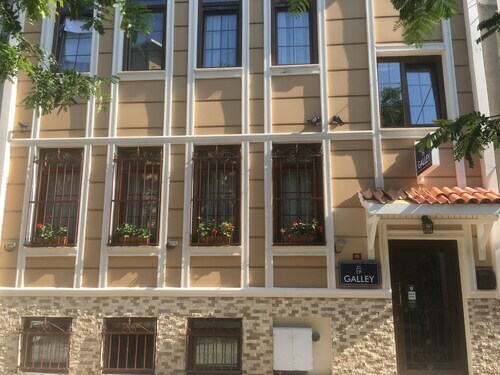 Located in Pendik, this bed & breakfast is 2.2 mi (3.5 km) from Viaport Outlet Shopping and within 6 mi (10 km) of Aydos Hill and Abdurrahman Mosque. Istanbul Park and Pendorya Shopping Mall are also within 9 mi (15 km). 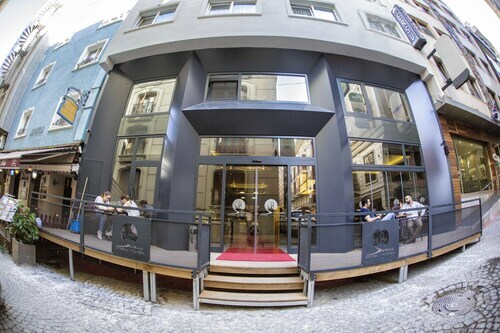 Located in Taksim, this bed & breakfast is within a 10-minute walk of Istiklal Avenue and Pera Museum. Taksim Square and Galata Tower are also within 1 mile (2 km). Tunel Square Station is 13 minutes by foot and Tophane Station is 13 minutes. Located in Sultanahmet, this historic bed & breakfast is within a 15-minute walk of Little Hagia Sophia, Grand Bazaar and Hippodrome of Constantinople. Sultanahmet Square and Blue Mosque are also within 1 mile (2 km). Istanbul Kumkapi Station is 5 minutes by foot and Cemberlitas Station is 12 minutes. Located in Sultanahmet, this bed & breakfast is within a 10-minute walk of Cemberlitas Bath, Grand Bazaar and Hippodrome of Constantinople. Sultanahmet Square and Hagia Sophia are also within 15 minutes. Cemberlitas Station is only a 5-minute walk and Sultanahmet Station is 7 minutes. 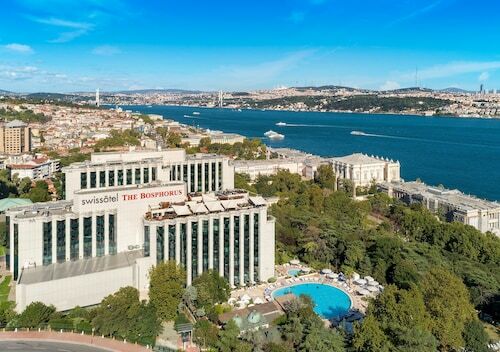 If you really want to get to the heart of Istanbul and explore the destination like a local, bed and breakfasts could just be the perfect choice. They crank up the character with their unique offering of bespoke rooms and suites. You'll find spots with heritage architecture and interesting original design features. 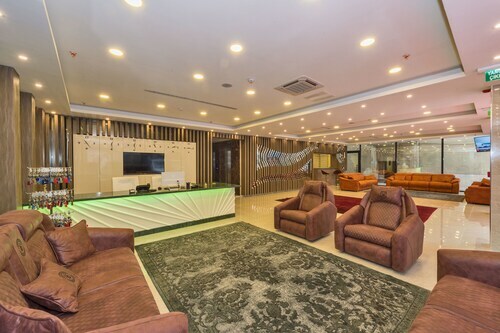 You'll get a warm welcome from people who are passionate about hosting travellers in their lodgings. You'll also feast on taste-bud-tingling meals waiting for you in the morning – it's all part of the B&B package. Whether it's a romantic minimoon or a well-deserved escape from the Rat Race, bed and breakfasts in Istanbul are your ticket to an authentic travel experience. Many ooze character in a way that big-name hotel chains simply couldn't dream of. They're often steeped in heritage, laden with interesting design features, or just downright cool, edgy and individual. The reason? They are the brainchild of their owners, who lovingly bestow unique touches and nuances to make them stand out from the crowd. And the personality of these cosy pads doesn't end there. There's also the morning meal to factor in. Never mind your usual buffet of pre-boiled eggs and rotating toaster machines. It's caringly handmade and considered, often packed with local Istanbul delicacies that'll have your mouth watering the moment you wake up and smell the coffee – literally. Breaking the fast is also a social experience in bed and breakfast stays, offering you a chance to meet and mingle with friendly owners and guests before a day of sightseeing. What's more, Istanbul Bed and Breakfasts have the benefit of being part of the community fabric. Think of it this way – everyone knows you're a traveller when you hop back and forth from that high-rise hotel. That's not so when you're bedding down in a local home with local folk, eating local foods, and enjoying a setting that's indelibly local. You'll not only feel like you're a part of Istanbul, but others will feel like you're part of it, too. Budget-wary travellers could also find plenty to like from Istanbul Bed and Breakfasts. With features like WiFi, in-room TVs, outdoor seating areas, cosy communal lounges and – of course – homecooked morning meals all part and parcel to a stay, they do well to push those pennies as far as they can go. You'll also get in-the-know local tips that trump any a concierge could offer, not to mention the heart-warming vibes of a real home away from home. Pinpoint the top Istanbul Bed and Breakfasts by using our detailed destination map. You'll be able to zoom in and out to seek centrally located or more off-the-beaten-track options, and even find the B&B stays that are closest to the landmarks and attractions you're excited about the most. Just be sure to enter your travel dates and ebookers will list the top Istanbul Bed and Breakfasts for you. 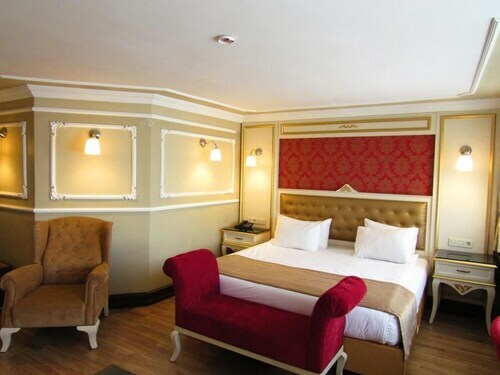 Located in Bakırköy, this hotel is 0.3 mi (0.5 km) from CNR Expo Center and 1.7 mi (2.8 km) from Sinan Erdem Dome. Istanbul Aydın University and Marmara Forum are also within 6 miles (10 km). DTM-Istanbul Expo Center Station and DTM - Istanbul Fuar Merkezi Station are within a 5-minute walk. 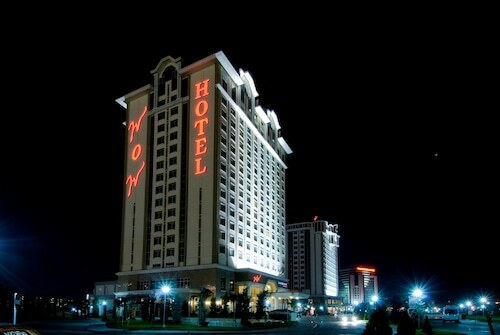 Located in Pendik, this hotel is 3 mi (4.8 km) from Viaport Outlet Shopping and within 9 miles (15 km) of Aydos Hill and Pendorya Shopping Mall. Istanbul Park and Neomarin Shopping Mall are also within 9 miles (15 km).